morning..and has this update. this is also a good time to remind you to sign up for weather call. this is also a good time to remind you to sign up for weather call. weather call will call you if your home is ever placed under a severe weather warning. keep in mind,,,, there is a charge for this service. you can sign up on our web- page.... at wtva-dot-com or call the toll free number if you need some assistance. a family is grieving this morning after a youngboy is tragically hit by a truck as he was getting on the school bus ... less than 24 hours ago... the accidenthappened on highway 3-70 near county road 25- 78 in the northeast corner of lee county.... which isin the pratts community... the assistant superintendent of the baldwyn school district says the bus was properly stopped when the child was struck.... the driver ofthe white toyota pick up stayed on the scene.... the nine year old boywas flown to lebonheur children's hospital with life threatening injuries.... sadly, he later died from his injuries...... hunter newman... of marietta was arrested and has now been charged with one county of aggravated assault... newman's bond has been set at 10-thousand dollars... thistragic accidentis underinvestigation... an investigation continues this morning into a tupelo high school teacher accused of inappropriate behavior with one of his students.. this is what we know now: the tupelo public school district says it suspended high school teacher braden bishop on monday... lee county attorney james moore says a probable cause hearing will be held in bishop's case.... he's accused of two counts of sexual battery and five counts of child molestation.... according to attorney moore the hearing has been scheduled for november 2nd at 1:30in the circuit court room in tupelo.... in tishomingo county... deputies have arrested a man they say lead them on a chase that resulted in a wreck... according to the sheriff...deputies attempted to stop a vehicle, they say was driving erratically... deputies lost sight of the vehicle for a short while... the sheriff says after a search of the area...deputies found the vehicle wrecked on highway 3-65 south with no one in sight... the vehicle...a beige 2008 chevrolet malibu was reported stolen by the owner who lives in iuka... and these pictures were sent to us by the owner emily jones... she tells us her car was stolen from her boyfriend's home, while they were gone... deputieslatercapturedand arrested 32-year-old paul roper in connection to this incident... roper was found in an abandoned home in burnsville... starkville police have released footage of last thursday's holdup at a convenience store.... here's the video surveillance released to us. in it...you can see the suspect in a blue bandanna jump over the counter, while pointing a gun at the clerk. ...he then stuffs cash from the register into his pocket... thankfully the store employee wasn't badly hurt... if you think you may know who the robber is,,, or have any information... you are asked to call golden triangle crimestoppers ... the search continues this morning for the person responsible for a wednesday afternoon shooting in corinth. the shooting took place at the corner of young and wick streets.... police say 27 year old demarcus tipler was taken by ambulance from the scene then flown to memphis after being shot multiple times.... no word yet on his condition.... investigatorsare looking for the person responsible. if you have any information that could help,,, please call the corinth police department ... a pair of cousins are accused of burglarizing some oxford storage units ... michael and joey williams are accused of breaking into 'your extra closet' on highway 278 westlast friday.00000&--pth5 thousand dollars each. >>> on highway 278 this is some surveillance video west from the robbery that last night.... police say the pair entered fr. bonds were set several storage units and stole. multiple items including a set of motorcycles.... >> this is surveillance video. they in the video, you can see the truck leaving the area..... enr ed several storage units. and the video you a lee county woman is wanted foe & exploitation of a vulnerableútre adult area. >> a sheriff jim johnson posted thiss picture of latasha ann wanted for exploitation of a vulnerable adult. the sheriff posting a picture of jones photo yesterday afternoon. the sheriff says jones used a fake lee county commissary fund latosha jones. that's her photo check to scam an elderly woman n out of 300 dollars. the screen. sheriff johnson says the victim gave jones approximately 300 dollars from her monthly check to pay her rent.... but instead of paying the elderly victim back her money - she gave us a bogus check worth 17 bucks.... if you know the whereabouts of jones --- call the lee county sheriff's office.... an oxford woman is behind bars.. charged with felony child abuse... 19 year old michaela lay was arrested on tuesday.... investigators say a complaint was filed with d-h-s on october 11th... about the child being exposed to a controlled substance... her bond is set at 10 thousand dollars... ((((( joel move to bnc for reality wx hit in b block ))))) >>> rain is still lingering in many spots. we will look at damage reports and talk about the storms lingering in our area in a moment. >>> at 7:21. let's take a live look on storm track doppler. storms lingering over alabama and going out of the area but there's pockets of rotation that could develop into a brief tornado touchdown maybe the likes of what we have seen this morning. we are constantly getting storm reports on our computers and we will be reporting those throughout the morning. emma is in the field with updates and surrounding areas as well. here is a live look at what's happening now. the main line of storms in northwest alabama. 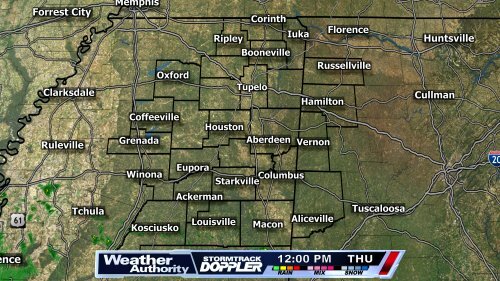 tornado watches linger until 1 p.m. in which of alabama and northwest alabama counties will be dropped at some point. rain gradually coming to an end. let's look at our storm tracker. we will push this forward. can you see heavy storms moving out of here through mid morning. notice through lunchtime we are dealing with clouds and dealing with spotty showers here and there. are we getting rid of the rain and strong storms, absolutely. it is happening now. >> going into the night tonight we will keep clouds around. notice looking at storm tracker it is midnight or after, we are cloudy and spotty showers. we go forward into the day happy thursday! widespread heavy rainfall will tomorrow. move through the region early notice some this morning with clearing stao take place. we will start out with temperatures in the 40s and maybe low 50s with clouds an embedded squall line. around. it is not out of the question this line has the potential to produce strong, damaging we might straight line winds have pockets well and the possibility headed out early friday morning. along with a rogue isolated tornado. & & perhaps it is easier to get around than maybe this morning with the trees down and we these storms will move across the region, likely moving east l get of us 45 by reports about thoss blocked from trees here shortly. through the day sunrise. then they should be out of the e region by mid-morning. will see skies clear out some. notice once they're gone, isolated light to moderate showers lingen throughout the time for rest of the day with overcast conditions. friday night fever or temperatures start out in the upper 60s. shortly travel spotty light showers up ander level but by the late afternoon, we'rr likely dropping into the upperbt 50s and lower comes through ande 60s.weekend things are winds will be breezy out of the northwest later in the day, loa bringing cooler air to little bit clearer athletes for saturday. here is the area by friday morning. a . but the clouds will not go away roads are completely into friday. wet. yes, storms are over and severe we will remain partly cloudy through the morning, clearing threat winding some into the down. you have the wet roads. if you are out afternoon. getting temperatures will be much from cooler, though. point a to poin morning temperatures will likeld haven't given start out in the upper 40s to a time lower 50s. you can hit an area f ponding and hydroplane. then by the afternoon, we will that's the main see highs in the upper 50s. thg forward and roads blocked a few isolated showers are due possible. to trees that have fallen. but most will likely remain dry. 64 up to hoe. if you are looking for the temperatures to saturday morning will start out mostly clear with temperatures p in the lower 40s. like yesterday, it's not happening. clouds stick then throughout the day, we'll d see mostly sunny to partly sunnm skies. the southeast and will eventually switch to the northwest setting the stage for a cooler friday. it is cooler temperatures will be a bit today warmer, likely climbing into tht lined in mid-60s. the mid to upper 60s the dry spell won't last long, though. and temperatures aren't isolated showers return to the g anywhere forecast by sunday. tonight unn goes down we'll start the day with and brs temperatures in the mid-40s. going forward to the rest of the the then by the afternoon, we're ind the upper 60s. times showers become a bit more likels into monday with partly to well& mostly cloudy skies.-57 and i te cooler. temperatures will be in the saturday 65. upper 50s early in the morning. a little more then in the afternoon, we'll seh spotty showers along with highsd morning near 70. low of 42 by the way. sunday spotty showers showers and storms may increased into your election day with cover and highs into the mid and high of . upper 60s. 70 monday with spotty showers. 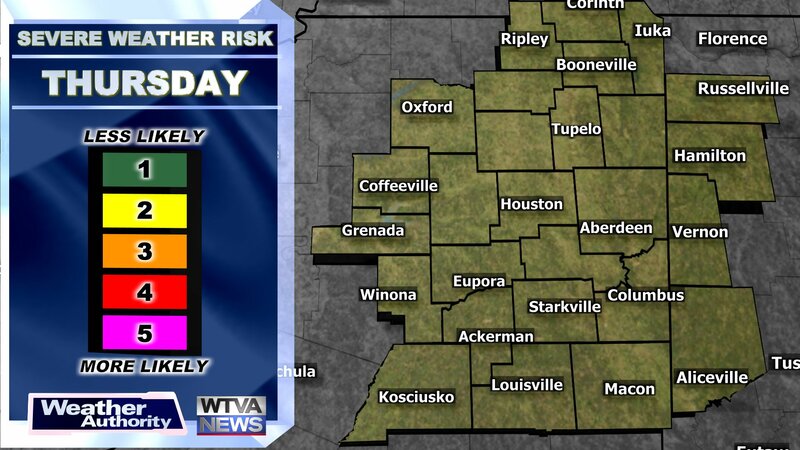 30% chance for more details, visit our ofn website at wtva.com and download our wtva scattered storms for election day. we will keep you updated on the coming days on that. before the time is now: lets check in with meteorologistjoel youngfor a >>> live, mobile late-breaking this is wtva 9 news. >>> all right. welcome it is 7:26 and we are breathing finally a sigh of relief. my director saying these storms are moving out of the area, at least stronger storms. if you are watching from fayette, we have viewers in that direction. will you see this line down here shortly as well. this is more of an alabama threat going forward and i want to look at how this is playing out. while many of you were sleeping and aware this was going on and had a way of taking shelter, of course, i want to point out one key feature. this right here. it almost looks like two separate lines. it will lose again. as it goes through calhoun county, notice how it circulates. can you tell the pattern moving north and eastward. that's kind of where we have seen most of our reports of damage at least in our area for the last several hours. look at these new reports coming in. >> you can see them plotted on our map right there will along that area from big creek. we have heard of big creek mentioned several times. i will go back and show you, i think you are probably doing the same exact thing and let you do your thing. he is working behind the scenes on our graphics here. >> these are some of the reports coming in now that folks are waking up. it just disappeared. we might get one shortly. big creek and calhoun city. trees were down across the highway there and some area. i believe we were having trouble getting the graphics. reported down on some area highways. i did get a report here a moment ago along the parkway in lee county and chicksaw county as well. we had reports of trees down and down around palmetto and this goes into the county from earlier at 6:00 a.m. >> i imagine you have several instances where you are without power. many of you may be watching from our wtva 9 severe weather authority app and news app and that's a great resource to have for events like this. >> we are showing you on a map all the reports and we had reports of the sun getting brighter. >> we will handle those in just a couple minutes and show you some of these reports and pictures this is video from red bay, alabama. we will get this into play and you can see the heavy rainfall and wind and trees and some of the trees they have down at that location. dawn with pictures here of some of the damage she is seeing as well. 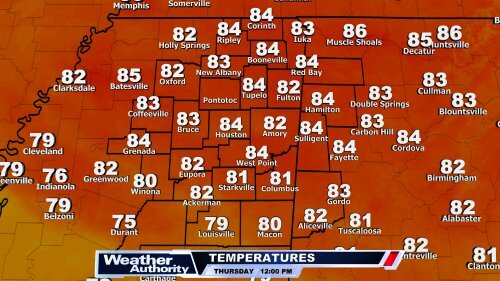 >> send your pictures to weather at wtva.